The Columbia Alumni and Association Network National Board, top row from left to right: John Davies '88, Braydan Hogue '16, Jeff Kinney '87; middle row: Brittany Steiger '10, Jennifer Oliver O'Connell '87, Karen Lee Coen '68, Hilary Rainey '09, Michael Wojcik '96; front row: Rebecca Ortiz '01, Dennis Carlson '97, Marty Kane '06, April Castro '96. Not pictured: Shani Black and Cayla Weisberg '09. Named in the style of Black Friday and Cyber Monday, #GivingTuesday comes a few days after the more familiar but less charitable consumer holidays. 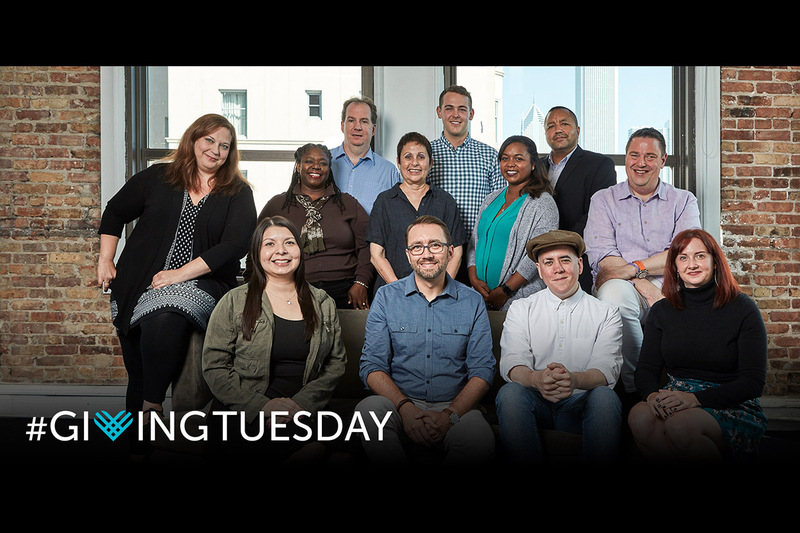 Created in 2012 by the 92nd Street Y and the United Nations Foundation, #GivingTuesday shines a bright light on acts of philanthropy, volunteering, and generosity via social media, and encourages giving toward nonprofits and other organizations that might otherwise be done privately. But #GivingTuesday’s popularity is more than hashtags and retweets. At Columbia, this has real world impact on the experience and education of Columbia students and the larger campus community. This is the first year Columbia has initiated a #GivingTuesday campaign. Leading the charge are Columbia’s Development and Alumni Relations team and the Columbia Alumni Association and Network (CAAN). As of this morning, the CAAN National Board has tripled their personal giving to Columbia. In October, Photography student Ari Kirsch received the Gianna Esposito Memorial Scholarship. Kirsch spoke to the family and friends of the former Columbia student, who passed away nine years ago. Esposito’s family established the scholarship and holds a biannual fundraising event. “When the family met Ari, [Esposito’s] aunts, uncles, and grandparents were giving him hugs,” says Director of Development Brice Kanzer. “It meant so much for them to meet Ari, and to hear how the scholarship enables him to work on honing his skills and improving his craft instead of having to worry about financing his education,” she says.